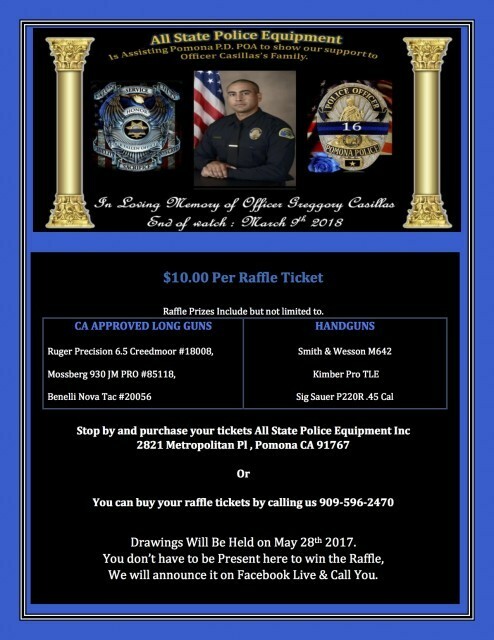 All State Police Equipment is assisting Pomona POA in support of Officer Casillas's Family by hosting a Raffle. Tickets are $10 each and prizes include (but are not limited to) CA Approved Long Guns and Handguns. Purchase your tickets at All State Police Equipment Inc or buy your raffle tickets over the phone by calling 909-596-2470. Drawings will be held on May 28th. You don't need to be present to win raffle prizes as they will be announced on Facebook Live and winners will be contacted.